Former Knesset Speaker waiting to see if she has Foreign Minister Liberman's backing for the post of president. Former Knesset Speaker Dalia Itzik announced on Thursday that she was able to obtain the ten necessary signatures from Knesset Members in order to run in the presidential election, Channel 10 News reported. 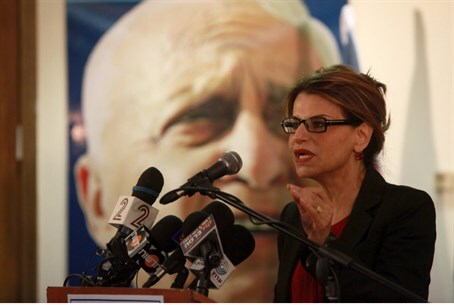 According to the report, Itzik will run for the position only if she is able to secure the support of Foreign Minister Avigdor Liberman. Itzik served in the Knesset between 1992 and 2012, first for the Labor party and then for Kadima. Following the 2006 elections she became Knesset Speaker and served as acting President for a lengthy period of time, when then-President Moshe Katzav took a leave of absence, and later when he resigned. Prime Minister Binyamin Netanyahu has been in a bind over the presidential election and has yet to announce whether he will support any of the candidates. On Wednesday, Minister Silvan Shalom decided not to run for the presidency when he understood he did not have Netanyahu’s support. Netanyahu has also been reluctant to support MK Reuven Rivlin and, in fact, was making desperate maneuvers to try and prevent Rivlin from being elected. It was speculated on Wednesday that Netanyahu would ultimately support Itzik over Rivlin. Another candidate whose name has been brought up for the post is former foreign minister David Levy, but Channel 10 News reported that he has decided not to run since it would be difficult to garner support. In addition to Rivlin and Itzik, other candidates include MK Binyamin Ben-Eliezer (Labor) and MK Meir Sheetrit (Hatnua).